For the last three or so years, a feral cat has been hanging out on this part of the hill. At first I wasn’t pleased to have him on the hill, fearing he would try to catch the birds around my cabin. My neighbors Dan and Mary Huntsman weren’t particularly happy to have the cat around either because it used to fight with their cats. 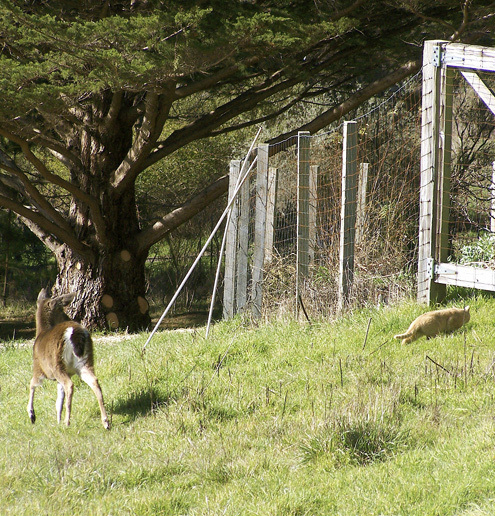 Over time, however, the cat began to fit into the neighborhood better, and the deer that also hang out on this hill were intrigued by it. 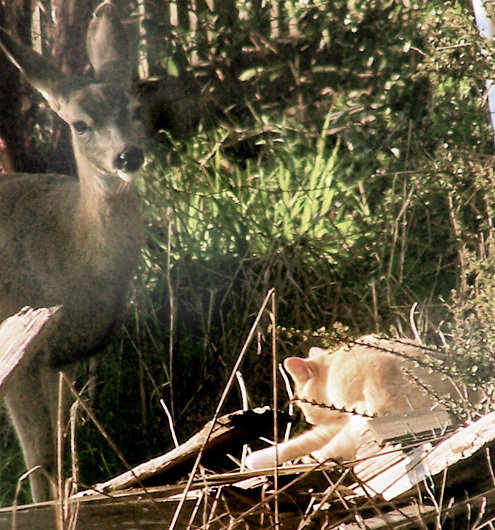 A doe watches the cat wash itself. On Valentine’s Day, however, I noticed the cat lying in the grass outside my kitchen window. It was so motionless I thought it might be dead, but eventually it got up, shook itself, and walked off. 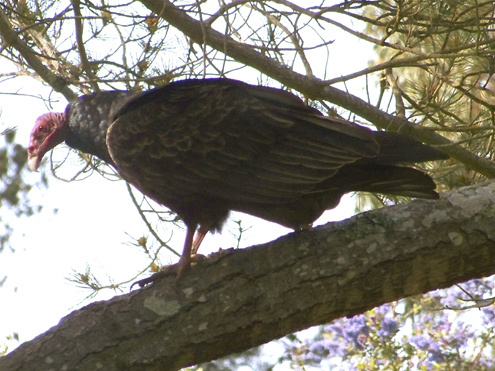 The next morning I was a bit surprised to see a buzzard sitting in a tree outside my living-room window. I had never seen a buzzard in the tree before. After looking around for a while, the buzzard flew off, but the following morning, it was back. Only this time it was on the ground eating the cat. Not only was the scene disturbing, I found myself wondering what killed the cat. 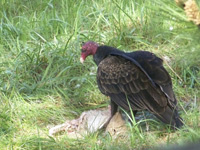 If the cat died as a result of eating a mouse or rat that had been poisoned, the buzzard could be poisoned too. The buzzard soon flew off, and I put the remains of the cat in the garbage to eliminate any further risk to buzzards. However, as my friend Tony Ragona pointed out later in the day, cats die for many reasons, and for all I knew this one may well have died from kidney failure. That made me feel a little better for the buzzard, but I still felt a bit shocked at having seen a housecat — albeit one that had gone feral — being eaten by a buzzard outside my window. The cat’s grim departure seemed one more reason to periodically put your spare change in the Planned Feralhood cans on the checkout counters of several stores in Point Reyes Station. 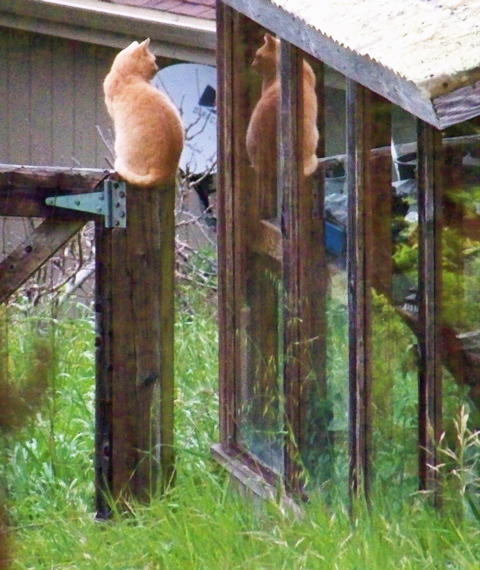 The program is headed by Kathy Runnion of Nicasio, who works at the Point Reyes Station Post Office, and it has been successful at humanely limiting the number of feral cats around town. 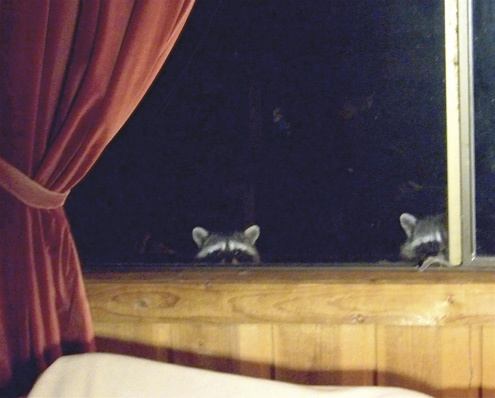 Another surprise: Last week I was in my loft one midnight dreary while I pondered weak and weary over many a quaint and curious posting of forgotten lingo when suddenly there came a tapping, as of someone gently rapping, rapping at my dormer window. But ’twas no raven tapping on my dormer window. 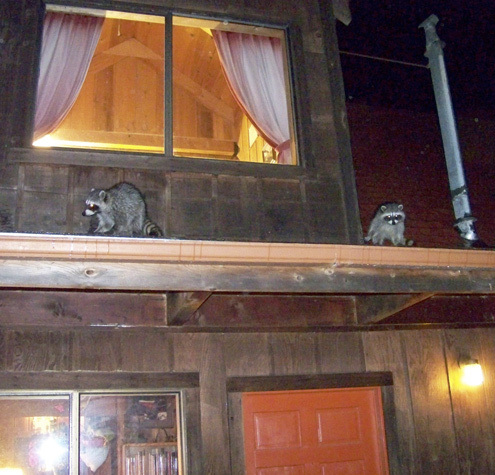 Two raccoons had climbed onto the eaves above my front door and were hunting moths attracted to the light coming through the glass. 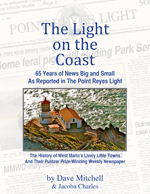 When I used to cover Sheriff’s Calls for The Point Reyes Light, I’d periodically come across a dispatcher’s report that some resident home alone at night was alarmed at hearing a prowler outside the house, sometimes on the roof. Inevitably a deputy would investigate, find no prowler, and conclude the culprit must have been a raccoon. The answer may not have satisfied the resident, but from what I’ve observed, most of the time it was probably correct. Sparsely Sage and Timely is powered by	WordPress 4.9.10 and delivered to you in 0.453 seconds using 54 queries.